We are the reputed manufacturer, importer, exporter, and supplier of an extensive array of Barbed Wire Making Machine. This barbed wire making machine is developed with excellence for achieving huge praise in the market. 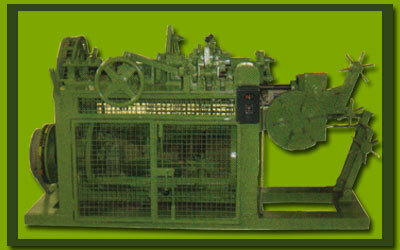 The offered barbed wire making machine is available in standard size & can also be provided with customization facility. In addition to this, the offered barbed wire making machine is carefully inspected on miscellaneous aspects of quality under the observation of quality experts. We, Bengal Wire Machinery, Howrah, established our operations in the year 2003, as one of the distinguished manufacturers, suppliers, exporters and importers of a vast series of Wire Machineries and Accessories. Our product compilation comprises of Wire Making Machinery, Wire Drawing Machinery and Bull Block Wire Drawing Machinery. At our end, we use supreme quality raw materials for the manufacturing process. Furthermore, it is made sure that all the predefined industry guidelines are fulfilled. We are quite popular for our standardized packaging and its budget-friendly prices. We are backed by an excellent infrastructure that is managed by a team of skilled & well-trained professionals, who work in full synchronization with each other to achieve organizational purposes. In the last few years, we have garnered a long list of key customers that includes Jagadamba Steel Private Limited, Nepal, Baba Strips & Tube Private Limited, Ranigunj, West Bengal and Citygen Umbrella Private Limited, Joka, Kolkata, West Bengal. We import our range from Italy and export to Bangladesh, Nepal, Sri Lanka, Tanzania, Utopia, Uganda and Kenya.